Satan hates God. He would do anything to oppose God. When God created Adam and Eve, satan showed up to deceive them and caused them to disobey God and fall into sin. There were consequences to both Adam and Eve because of that sin. They were cast out from the garden and fell under satan’s domain of sin and death. What many miss or overlook is, there was also a very disastrous consequence for satan. God was promising that SOMEONE would come and crush satan! Satan had won a huge victory against man, Adam but, another man, the seed of the woman, would come and defeat satan but it wold not be without a cost. Who did satan think it was? He didn’t know. All he knew was it would be a man, and it would be the seed of a woman. When Eve gave birth to her first son, satan must have been convinced that Cain was the ONE. So satan had his hands in Cain’s life, planting the seeds of sin, anger, jealousy, hatred in him so that satan could control him. Even when Adam and Eve had their second son, Abel, satan probably was not even interested. He was focused on his plan to destroy Cain’s life so Cain would not “crush his head” and destroy him. Then one day, something unexpected happened. When Cain and Abel sacrificed their offerings to God, He rejected Cain’s offering and accepted Abel’s offering! What a shck this must have been for satan! Something he had not foreseen at all! While satan had thought Cain was the one that was going to destroy him, this incident where God accepted Abel’s sacrofice and rejected Cain’s was a sign (or so he thought) that Abel was the ONE that God had promised would crush him. This was a sudden and dangerous situation for satan. He had no idea what kind of threat Abel posed. So satan had to act immediately. He used Cain, whom he already had control over to murder Abel so he could get rid of the threat to him. Now satan thought he had defeated God and destroyed His plans. But he soon realized that Abel was not the ONE after all! There was SOMEONE else still to come. But who? When you read the Bible beginning from Genesis, you will see satan’s desperation throughout the centuries in trying to find out who the ONE was and his attempts to destroy those he thought was the ONE. Satan knew from the prophecies that the ONE would come from the lineage of Abraham, Isaac & Jacob. Therefore he kept a close eye on this family line. Joseph was born around 1750 BC. He was the favoured and special son of Jacob and Rachel. So satan now thought that Joseph was the ONE. Satan incited Joseph’s own brothers to kill him, and they eventually sell him off as a slave to a foreign country. Satan was content with that and tried to ensure that Joseph would rot in a prison in Egypt for the rest of his life and pose no threat to him. But God rescued Joseph. Not only preserving his life but elevating him to the position of Prime Minister of Egypt, shaming satan! Of course, satan was furious. Satan knew the line of Jacob was continuing to grow and soon the day will come when the ONE will appear! He then pushes the pharoah to order the killing of all Hebrew baby boys born in a desperate attempt to wipe out any future seeds of Jacob’s family! He fails again. Moses is born and survives. And God uses him mightily to bring the enslaved Hebrew people out of Egypt, symbolizing how the ONE would would come one day to also lead His people out of slavery to sin and satan just like Moses did. This was getting serious for satan. For the next 500 years satan goes after individuals, one after another, whom he thinks would be the ONE, trying to corrupt them, to turn them away from God and to destroy their lives. Read the accounts in the Bible. David was born around 1150 BC. The prophet Samuel prophesies that God will see to it that it would be one of David’s descendant who will have the throne forever! Satan realizes if he could kill David, then David would have no descendants and the ONE he dreaded would never be born! Satan uses King Saul to try and kill David many times but fails. Even the giant, Goliath, was no match for him. Satan was so desperate that he even uses David’s own son, Absalom, to try and kill David. In the end, both Saul and Absalom and all of David’s enemies die but David lives and takes the throne of Israel and becomes the greatest King of Israel. Satan tries everything but God protects the lineage of Abraham, Isaac & Jacob from the hands of satan and God fulfills His purposes in their lives. Satan could do very little to stop God’s plans. Time and time again satan fails to identify the ONE who would be coming to crush him. Satan sees this and gets some very important clues! Now he knows The ONE must be born of a virgin! In Bethlehem! He had been targeting the wrong ONES for thousands of years! Now he knew what to look for. He can relax for now…and then…. Seven hundred years later, Mary, a virgin, gives birth to a son in Bethlehem. Satan rouses up, excited and scared at the same time. The ONE had come! The ONE he had been dreading was finally here! All the signs were fulfilled. Born of a virgin. Seed of a woman. Born in Bethlehem. A descendant of David. Everything had fallen into place. Satan wanted to strike early and fast before this baby could even grow up and crush him. Satan uses King Herod to order the killing of all baby boys in the region! Many babies are slaughtered but satan fails to touch Jesus. As Jesus grows up satan realizes that Jesus is no ordinary man. He was perfect. He was sinless unlike any man since Adam sinned. But no one is sinless except GOD. Could it be??? His worst fears are realized. He sees the signs and Jesus ‘ own words confirms it. God didn’t just send any man! He came Himself in the form of human man! This revelation shakes satan to the core. This was something completely unexpected! But satan feels that as long as God had limited Himself in a human body, he will have a chance to kill Jesus. For the next 3 years satan works furiously to find ways to kill Jesus ~ the crowds, the Jewish authorities, Jesus’ enemies, the attenots to stone him, the attenpt to throw him off a cliff; everything fails until he manages to make use of one of Jesus’ own disciples, Judas, to betray Him. There was no one happier than satan when Jesus was crucified on the cross. His plans had succeeded! He had killed Jesus, the ONE who was supposed to crush him! He had won! He had defeated God Himself! God’s promise to crush satan seemed to lie in shambles. What satan failed to realize was that it was not over yet! Satan seemed to have won but was about to lose the WAR. Big time! 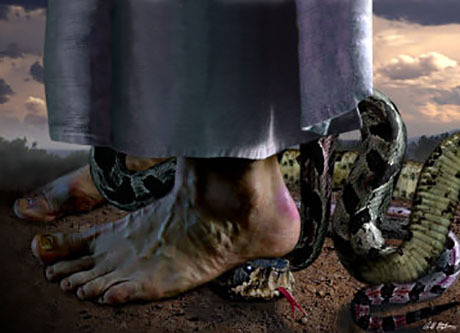 Jesus was killed but it was merely a “strike at his heel”. You see, Satan had thrown his ultimate and final weapon at Jesus. DEATH. Jesus, as a man succumbed to it but Death was not powerful enough to keep Jesus dead like every other human being! Jesus, the Divine Son of God overcame Death! “Death has been swallowed up in victory.” (I Corinthians 15:54). With Death’s defeat, satan was now powerless! He had been stripped of all his authority including his last and most feared weapon! Where Adam failed, Jesus succeeded! Where Adam had surrendered his authority to satan, Jesus regained it back! Now anyone, including you and I, who choose to stand behind Jesus and trust Him as Saviour would receive Jesus’ victory over satan. This means we’re saying YES to Jesus’ Kingdom and NO to satan’s defeated kingdom. Satan has no more power over anyone who chooses Jesus. We’re no longer sons of Adam. We’re now sons of God through Jesus Christ. If you choose to remain a son of Adam, you will be cast out like he was. if you choose to be reborn as a son of God, you have a new life. Satan now only has power over those who continue to reject Jesus because their sins are still unpaid for, because they have refused Jesus’ offer of salvation and forgiveness! Death still hangs over them. Satan now only has one potent weapon left. DECEPTION. That’s what he used against Adam and Eve in the beginning. Now until the end of the world, he will use it again and again to deceive. He is the greatest deceiver and Jesus said, satan is the father of lies. Satan’s greatest regret might be not understanding God’s plan of salvation. What satan thought was his greatest victory at the cross was actually his ultimate defeat! That’s why he hates the cross. Because it is a reminder of his defeat and failure there! Now satan must continue to use deception to try and wipe out the memory of his blunder. How? By denying what happened at the cross! And denying that Jesus died! Are you one of those who say this today? If you don’t know what really happened at the cross, you will have no chance at salvation. If you believe that Jesus did not die, there is no chance of forgiveness of sins for you. You will remain a sinner and when you die, satan takes you to hell. As long as you don’t make it to heaven, it’s satan’s small act of revenge and rebellion against God who loves you and wants you saved through His Son. This is satan’s final agenda now until the end comes. Who Is The Real Mary, Miriam, Mariam?